Finally some photos! Winter really isn’t a good season if you prefer to shoot your knits by daylight. Anyway, here they are! The mittens with sausages! This is what they look like when you remove the flap. 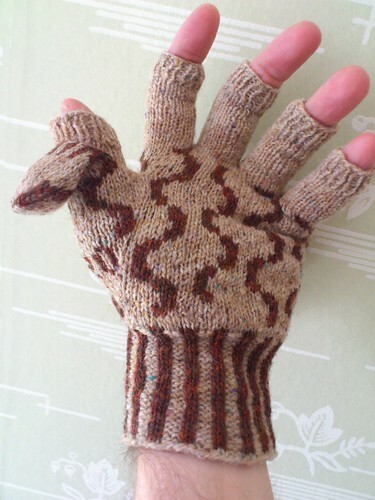 There’s even a thumb flap. For more comfortable wear, I added a thumb wedge. I started this project in 2011 and thought it was worth a mention. 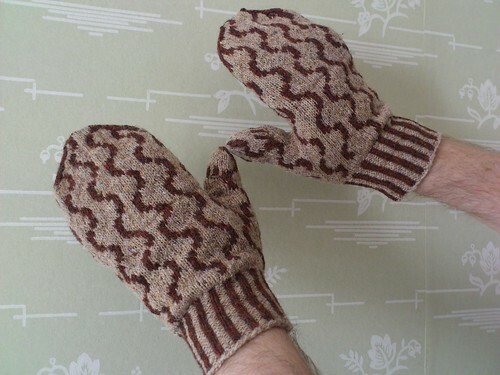 These mittens were a gift to my husband. 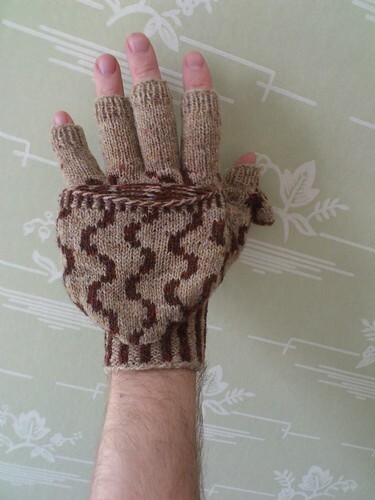 He wears them all the time and appreciates the flaps a lot since he’s not normally fond of mittens but prefer gloves. This way he can have both. 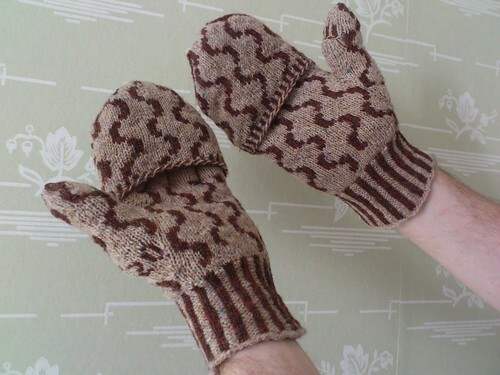 For some reason knitting the second mitt is a lot quicker. Probably because I already know what to do with it. 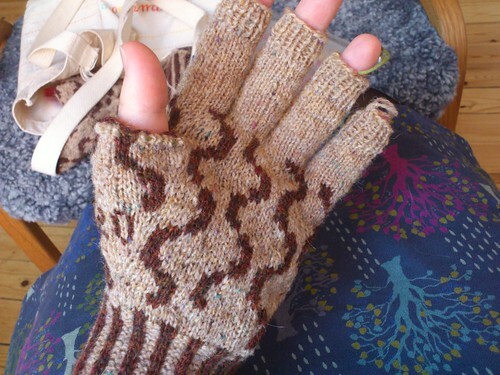 I made a lot of modifications to the original pattern, and figuring these out and making notes on them obviously slowed my knitting progress on the first mitt. I’ve even begun the flap that will cover the fingers. Another reason why this is going fairly quickly is that I’ve spent a good portion of the post-New Year holiday knitting. Knitting and listening to old episodes of Cast On. I never get tired of Brenda, she’s so smart and witty and and funny! The production of the podcast is really fantastic. If you haven’t discovered her podcast yet – I strongly urge you to check it out! And listen to the them in the correct order – that makes it even more enjoyable. I’m so glad that she’s still doing it after over six years of podcasting. I have some favourite episodes and themes, I’ll probably get back to you on that later. 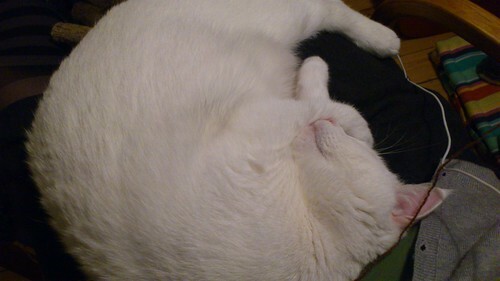 Another way to make my knitting run smoothly is to have a snoring cat on my lap. And belive me – he snores loudly! 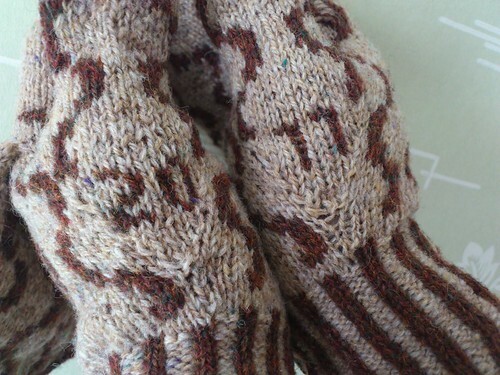 I really hope to finish these mittens this week so I can get back to some of my other projects. And perhaps start a new one.